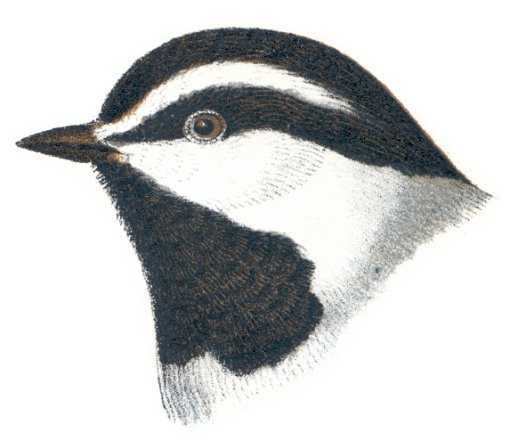 About four inches or a little longer, black crown and throat, white supercilium (line from the base of the upper mandible over the eye to the back of the head). White on sides of the head to the back of the neck. Gray back, wings and tail. Light grayish white underside. 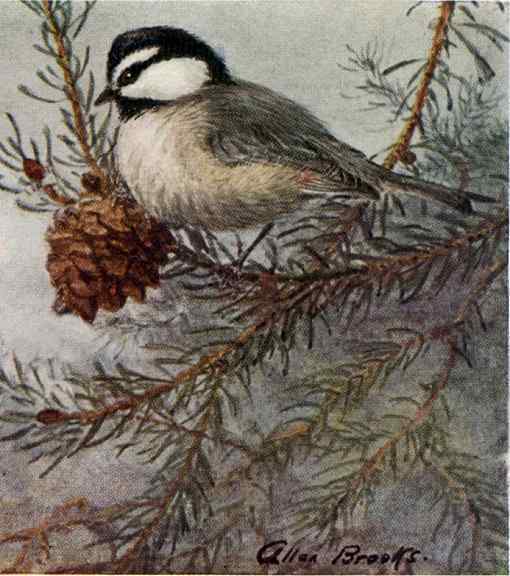 Mountain chickadees inhabit coniferous and mixed forests year around in the mountainous regions of western U.S. from New Mexico, Arizona, California and Baja to Montana, Idaho, Washington, and British Columbia. They forage in trees and thickets for insects, their eggs and larvae, spiders, cone seeds and fruit. Visits feeders. Feed Chickadees sunflower seeds, nyjer (thistle seeds), nuts and suet. Build nests of grass, plant down and wool or hair in natural or abandon cavities, or excavate their own cavities in trees and stumps from near the ground up to twenty feet. They also nest in properly sized birdhouses well placed in their favored habitats. Females lay six to ten, more or less, white, sometimes speckled eggs which hatch after about two weeks incubation and young leave the nest in about another three weeks. They hiss like snakes and feign hostile motions if intruders threaten their nests. The Mountain Chickadee Birdhouse (same as for Nuthatches, Titmice, Downy Woodpecker and other Chickadees) has a 4″ by 4″ floor, 9″ inside ceiling, 1 1/4″ diameter entrance hole located 7″ above the floor and ventilation openings. Place a few wood chips, not sawdust, on the nest box floor. Remove the nest and clean the box well after the brood rearing season is over. If you mount a Winter Warmer and occasionally lift the lid in cold weather, you may see several cuddling chickadees and possibly with titmice and nuthatches. Nuthatches, titmice, downy woodpeckers and other chickadees may use this box. They forage in trees and thickets for insects, their eggs and larvae, spiders, cone seeds and fruit and visit feeders. Feed Chickadees sunflower seeds, nyjer (thistle seeds), nuts and suet. Secure hinged roof with brass shutter hooks for easy access. Assemble with corrosion resistant screws fit to pre-drilled countersunk pilot holes. Mount nest box on a tree trunk or hang from a limb from chest level to just out of reach, higher if necessary. Place a few wood chips, not sawdust, on the nest box floor. Remove the nest after the brood rearing season is over. Mountain Chickadees are year around residents. If you mount a Winter Warmer and occasionally lift the lid in cold weather, you may see several cuddling chickadees and possibly with titmice and nuthatches. Nuthatches, titmice, downy woodpeckers and other chickadees may use this box.